Oooo..wow - the Copic colouring looks great! 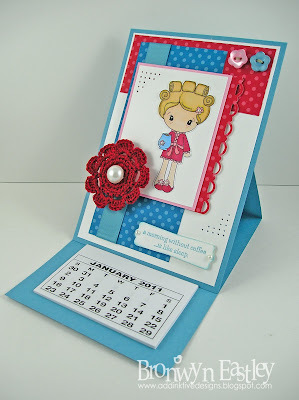 Love how you have the craft activity for the new year sorted already!!!! It looks awesome! Great to have on ur desk! oooooh, so pretty, Bronwyn! 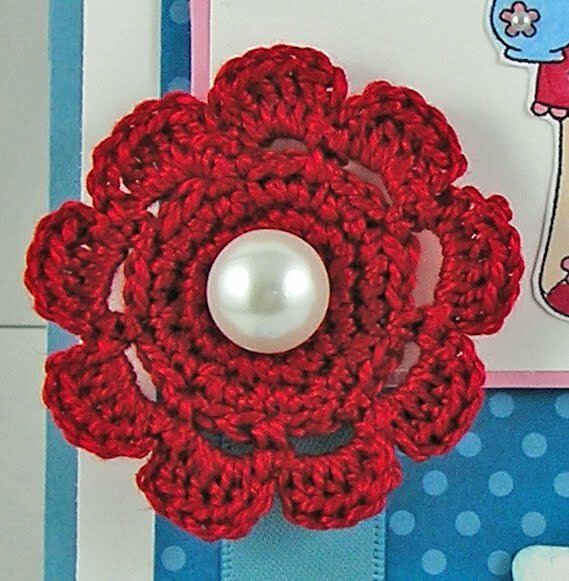 Love your colouring and that crochet flower! This is just gorgeous. I love the image and your colouring is just beautiful. I love the idea of this with the little calendar at the bottom, so clever. The crocheted flower is just perfect. Beautiful!! Wowee Bron your colouring is fabbo! 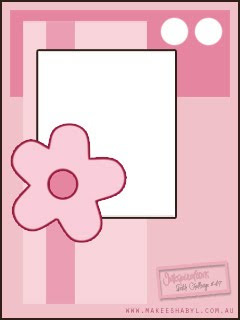 That flower looks perfect for your calendar and how good does it feel to have term 1, 2011 sorted! I love this little project of yours. Luv this!! Good job!! 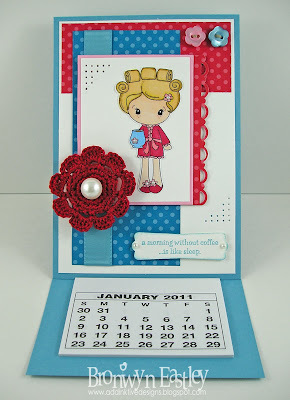 Would like to know the blog you look at for tutorials!!! Absolutely gorgeous Bronwyn! Do you have measurements or template you could share with me for this one? I would love to make some! Oh how sweet! Where did you get the mini calendars? It's just too cute! Gorgeous, Bron! Love the colours, and your colouring, and the crocheted flower is absolutely beautiful. Glad you will get to enjoy this lovely project for the whole year! I would also love to know where you get the calendars too please. WOW! This is utterly adorable! 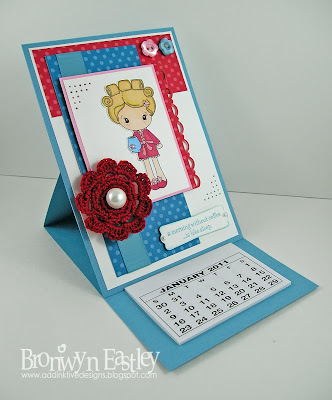 I love the idea of adding a calendar to an easel card. Great coloring with your coloring! TFS! Great card. I just love the easel design too. That flower is just yummy and I love the design you've used on this. Great job! Congratulations Bronwyn! 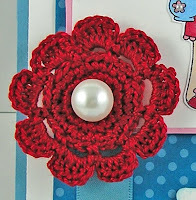 I love the design, the colours, your colouring and that crocheted flower with the pearl is so pretty!